It's nice to have a drink on an airplane, whether you're taking a flight somewhere fun or for work. However, what's not so nice is the high prices and relatively bad quality of the liquor that's available. If that's what's holding you back from having a nice tipple, never fear: we've got several ways to make airplane booze taste better, from wine to beer to hard liquor (and some sneaky ways to save some dough, too). We've already shown you how the simple act of aeration can make almost any wine taste better. That's because when you expose wine to air, the volatile compounds that make wine taste harsh oxidize. That is, they break down and begin to disappear. You can aerate your bad airplane wine by pouring into a wide-mouthed cup and letting it sit out for several minutes (I try to make it to 10, but I usually break around minute 5). Alas, some flights are short and others can be turbulent, so what do you do then? David Yanofsky of Quartz points out that other methods of aeration (pouring wine from container to container, using a blender to hypercant it) aren't really convenient on a plane. Instead, he suggests using the container itself to hypercant the wine, or get air into it at a super-fast pace. Pour out a little wine into your cup so there's extra space in the bottle. Then shake that mother up (but don't shake your whole seat, or you'll get glares from your neighbors). 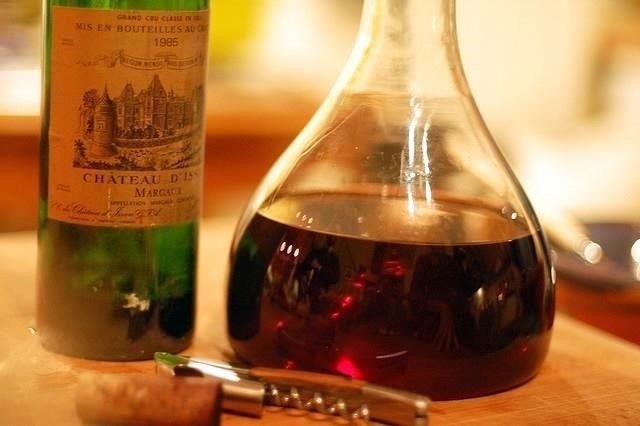 If you're really thinking ahead and don't mind waiting a few minutes, you can be a true wine nerd and bring a tall, empty container with you—glass or plastic are preferable to metal, paper, or Styrofoam, which might make the drink taste funny. That way you don't have to worry about turbulence spattering wine all over your shirt—but getting your drink down before your short hop between L.A. and San Francisco will still be a factor. The TSA says it's fine to bring alcohol in your carry-on baggage. It just has to comply with the 3-1-1 rule (under three ounces and fits in a one-quart plastic baggie). It may mean foregoing shampoo or conditioner, but again: cheap booze. Just remember that national laws and most major airline rules say you can't drink alcohol unless it was purchased from an attendant, so you'll have to be super-cool about getting to your contraband. If you're not crazy about taking up space in that already small plastic bag of toiletries, then get some Pocket Shots instead. 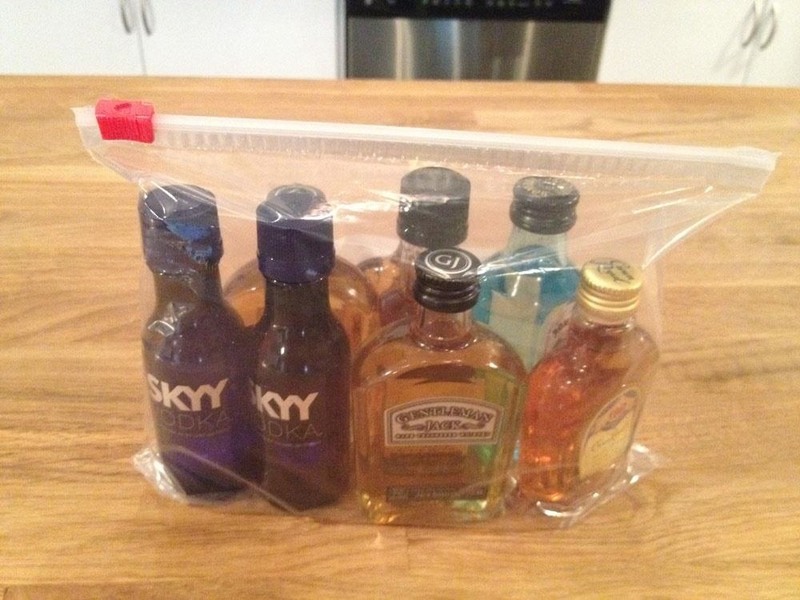 These plastic pouches contain 1.6 oz of liquor each and are easier to pack than the classic mini bottles. The LA Weekly reviewed a few of the flavors and gave the bourbon and rum high marks. Andrew Knowlton, restaurant and drinks editor for Bon Appétit, has three near-classic cocktails that he makes on the plane. The secret to elevating the quality? He brings his own cocktail add-ons or sneaks them from the airport food court beforehand. Add a dash from your own mini-bottle of bitters, an extra lemon wedge, and gin over a cup of ice. If there's a reasonably good Mexican restaurant in the food court, ask for a little hot sauce in a to-go container. Get your preferred beer, a cup of ice, a couple of lemon or lime wedges, and Bloody Mary mix. Mix according to your taste in the cup. Add hot sauce last. It's a variation on the Caipirinha, a favorite Brazilian drink made with rum, sugar, and lime. Take one packet of raw sugar from the food court's classiest coffee shop (plain ol' white sugar will do, but it's not as good). Next, request a vodka mini, an empty cup, a cup of ice, and a few lime wedges. Use the vodka bottle to muddle (lightly mash or press together) the lime and sugar. The idea is to express the juice and some of the aromatic oils in the lime peel and have them mix with the sugar until it's syrupy. Add ice and vodka. Stir. Drink. Sigh with happiness. 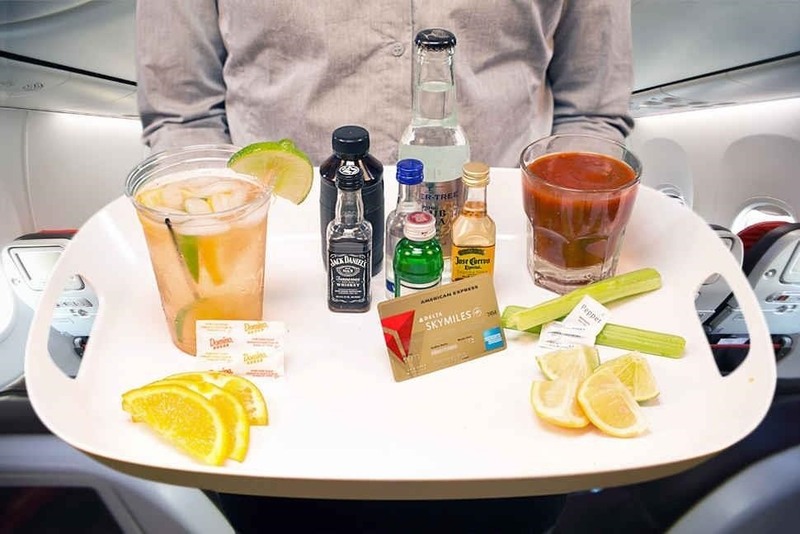 Want more ideas for in-flight cocktails? Thrillist has great ideas for even more DIY airplane cocktails, especially if you remember to pack your own garnishes beforehand. Jaunted.com reports that on certain holidays, Southwest Airlines will give its passengers a free drink. There's only three more freebie days for 2014, but here's the whole list so you can think about next year, too. Southwest officials confirmed to me that the airline generally hands out one free drink per passenger on all of holidays and notable occasions listed above. Of course, if it's not listed as a freebie in the latest in-flight menu, it's not "official" official. Southwest is also one of only a few airlines that now carries craft beer on their drink carts, so if you're a fan of Fat Tire brews, you're in luck. What airplane cocktail hacks do you like? So if one way to aerate wine is to shake it in its bottle, why isn't a bottle of wine in a restaurant just shaken after you pop the cork from it?